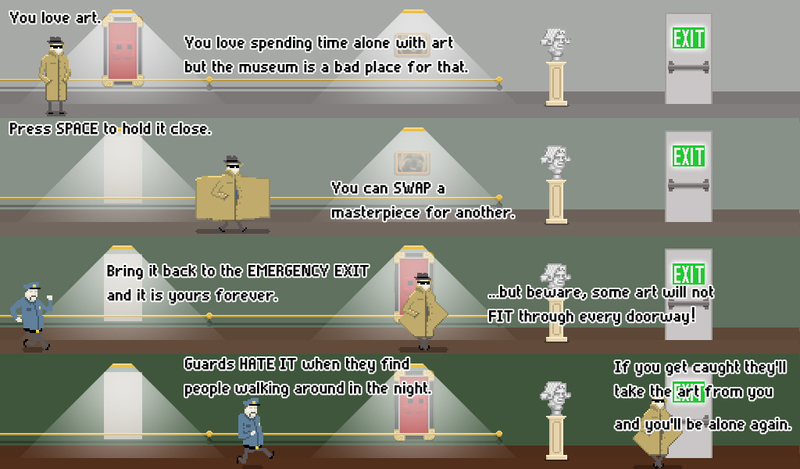 Alone I Art is an arcade stealth game where stuff art pieces in your trench coat and smuggle them out of there, while avoiding the security guards patrolling the area. It was made in 72 hours for Ludum Dare 22 as part of team Make A Game. It got 4th place overall, and won the gold medal for humor! The goal of he game is to get as many art pieces as you can out of the museum without being caught. Their shape and size won’t make it through all of the doors, so you have to plan your exit accordingly! We wanted the players to have fun exploring the museum and seeing all the paintings, so early on we started collecting themes we enjoy. Every one of the 72 paintings was different and custom-made. The main menu has a gallery where you could see bigger versions along with a caption. It was the first time we had a tutorial in any of our games. It was a single image, but it conveyed the theme and main goal. It was important to get the players in the right mood to be able to play as soon as the game starts!